Considering adopting? Before visiting Mayhew, we recommend you read this page carefully. There is a lot to consider before adopting a new family member and Mayhew can help find the perfect pet for you. All our animals receive thorough behavioural and health assessments before they are ready for rehoming. This includes microchipping, vaccinations, neutering, defleaing and worming. Visit the animal rehoming pages on our website to see who is available for rehoming. If you see an animal that might be right for you, please get in touch with our Reception team. Our team will assess your requirements and try to match you with the right animal. If there is a good fit, you may be able to meet that animal on the day of your interview. If you are successful in your interview, you will pay the rehoming fee for that animal (Dogs – £145 / Cats – £75). We will then reserve the animal for you. Once you have found your perfect pal, we will conduct a home visit. This is to make sure your home is suitable for your potential new pet and to meet other members of your family. Arrange to take home your new best friend! Do I need to visit Mayhew before I can reserve a cat or dog? Yes. We will only place a cat or dog on reserve once we have met and discussed the animal with you in person at Mayhew. If the animal is in a foster home, we will place the animal on hold if your interview is successful. You can then visit them in their foster home. 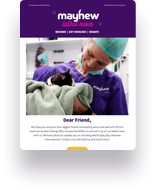 Mayhew has limited resources and we rescue a large number of abandoned and stray animals. Due to this, we are unable to discuss individual animals by phone or e-mail. It is important that you meet our Adoption Officers in person, so that we can ensure our animals find the perfect home. If you have an interest in adopting an animal from Mayhew, please visit or call us as soon as you are able. We offer walk-in appointments at Mayhew from Tuesday to Friday between 12pm and 3.30pm. On Saturday, Sunday and Monday, please call us to arrange an appointment on 020 8962 8000. How much time will I get with my potential pet? There is no limit on the time you can spend with your potential pet. We encourage you to spend as much time with them as possible. Before taking your pet home, you can take your dog on a long walk or spend time with your cat in their cabin. You can also take dogs to their new home for a day visit. If you are adopting a cat, you can get to know them in their cabin, and bring in blankets and toys. This will allow them to get acquainted with the smells of their new home. Do I get to meet all of the animals at Mayhew when I visit? You will be able to meet any animals that we feel could be right for you. Our Adoption Officers will review this with you during your adoption interview. Unfortunately you will not be able to meet any other animals. Can I take the animal home with me on the first day that I visit? You cannot take the animal home on your first visit. We will need to carry out a home check before you take the animal home. The animal will also have a final veterinary health check before they leave Mayhew. Home visits are very important. They ensure that the environment will be suitable and that our animals will have a happy life. It is also a good opportunity for you to ask for advice and information on caring for your new pet. Can I adopt if I have small children? Some of our animals will be suitable for families with young children. We make this decision as part of the animal’s assessment. Parents must be happy to teach the children how to respect and treat animals. Children will also need to visit Mayhew to meet the animal before adoption. For further details, please look at the individual animal's online profile. I work full time/part time. Will this affect my chances of adopting? We are happy to rehome animals to people who work part-time and full-time. Each animal undergoes an assessment to decide how long they can be left alone for. Details for this are included in each animal's online profile. The maximum time we advise for dogs to be left alone without a break on a regular basis is 4-5 hours. Cats can be left alone for longer if their assessment states this. Think about this carefully as a pet could affect the next 10+ years of your life. If you work full-time, you will need to either: - introduce us to the person caring for the animal during the day - provide us with proof of a professional animal walker - provide a letter from your line manager allowing you to go home during your lunch break If you work full-time, you will not be able to adopt kittens under six months. For older cats, you must have a cat flap or have one installed before we do a follow up visit. Can I adopt if I live in a flat or have no garden/outside access? Dogs - We are happy to rehome dogs to committed people regardless of whether they have a garden or not, or if they live in a flat. Some dogs may need to live in a house or in a ground floor flat with a garden. If this is the case, details will be on the dog's online profile. Cats Most of our cats will need outdoor access. They should have the opportunity to explore and be independent. Sometimes, we have cats that will not be able to go outdoors. These cats can be rehomed to people that do not have a garden or outside access. These cats may be elderly or have health problems. Can I adopt if I live outside of London? Yes, we rehome to anywhere in the UK. Potential adopters will need to carry out at least two trips to Mayhew in London. Your home visit may also take longer to arrange. Can I adopt if I already have an animal? Some of our animals will be suitable to live with other cats or dogs. Your pet must be comfortable living with another animal and must meet them before adoption. If you have a dog, please bring it to Mayhew when you come to meet us. Our cats are 'dog-tested' and their online profile will state whether they can live with a dog. If you already have a pet which has not yet been neutered, this will need to be done before reserving a Mayhew animal. If they have not been neutered due to the health issues, please provide vet confirmation. Yes you can adopt if you live in rented accommodation. You will need to provide a permission letter from your landlord, the council or housing trust. By providing this letter when you first visit, the adoption process will be much quicker. Do you have any age restrictions for adopting an animal? You need to be over 18 years of age to adopt an animal from Mayhew. If there is an increased chance that your pet might outlive you, we will ask to meet the person who would take them on. Can I adopt an animal and keep them outside? We expect dogs and cats to be treated as part of the family. They must have full use of the home as well as the ability to go outside. At no point should you leave the animal outside. We do not rehome dogs as guard dogs. Will my potential pet have any health or behavioural problems? Our animals receive a full health check and behavioural assessment. If we discover issues during this process, we will always inform you. We will make it very clear to you if an animal has any health or behavioural problems. There are no long-term guarantees. Any animal can develop health or behavioural problems at any point in their life. Mayhew is here to offer guidance throughout the animal's life but if you adopt an animal from us, you will need to register them with a local vet. If required, you will need to seek help from a professional behaviourist. Fees for these services can be expensive, so for this reason we recommend pet insurance. What if I can’t cope with my new pet? It is normal to have some anxiety in the early stages of your adoption. You can call us on 020 8962 8000 to discuss any issues and we will do our best to help and support you. It is rare that we need to take animals back into Mayhew as our adoption process is very thorough. In exceptional circumstances, we will take in animals that you can no longer care for. If you are successful in your interview, you must pay the rehoming fee on that day. This means that the animal is reserved for you. Other potential adopters cannot view or adopt that animal. The fee includes neutering, microchipping, vaccinations, flea and worm treatment and a vet check. A full behaviour assessment and a starter pack of food is also included. We require all of our young dogs and puppies to attend training classes with their new owners. You will need to register and pay for a course of lessons with a local class before taking your animal home. We will need to see a receipt from the trainer. The adoption fees go a small way to covering our costs. We spend an average of £1,000 on each animal that comes in for rehoming, which covers their veterinary treatment, food and accommodation. Mayhew receives no government funding and relies upon the generosity of the general public. Could you foster a cat or a dog? Mayhew are looking for volunteers who are able to provide a temporary home to our rescued animals.